The Biodiversity Information Service for Powys and Brecon Beacons National Park (BIS) is the Local Environmental Record Centre for the county of Powys and the Brecon Beacons National Park. This area includes the vice counties of Montgomeryshire, Radnorshire and Breconshire and includes parts of Carmarthenshire, Monmouthshire and Denbighshire. BIS provides a mechanism for collating, sharing and utilising the wealth of biological data and knowledge, which exists in Powys and the Brecon Beacons National Park. The aim of BIS is to make information on wildlife, their habitats and important sites, readily available to those who need it. This will ensure that decisions, which may affect the natural heritage in the Powys and Brecon Beacons National Park area, are made with the best available knowledge. Brecknock Wildlife Trust (now WTSWW Brecknockshire) species records collated and digitised by BIS. Many are on WTSWW BWT reserves or Wildlife Sites and include general surveys. Bird records collated by Brecknock County Bird recorder including recorders digitised from species cards under contract supervised by BIS and funded by Welsh Biodiversity Partnership. Sensitive records have been removed. Other bird records may be included in other datasets managed by BIS. INNS records collated and digitised by BIS. This is the majority of records collated, digitised and held by BIS excluding any records known or thought to be already on NBN Atlas for example county datasets, National Scheme and Society datasets, third party data and where the data provider has refused permission to share to the NBN Atlas. 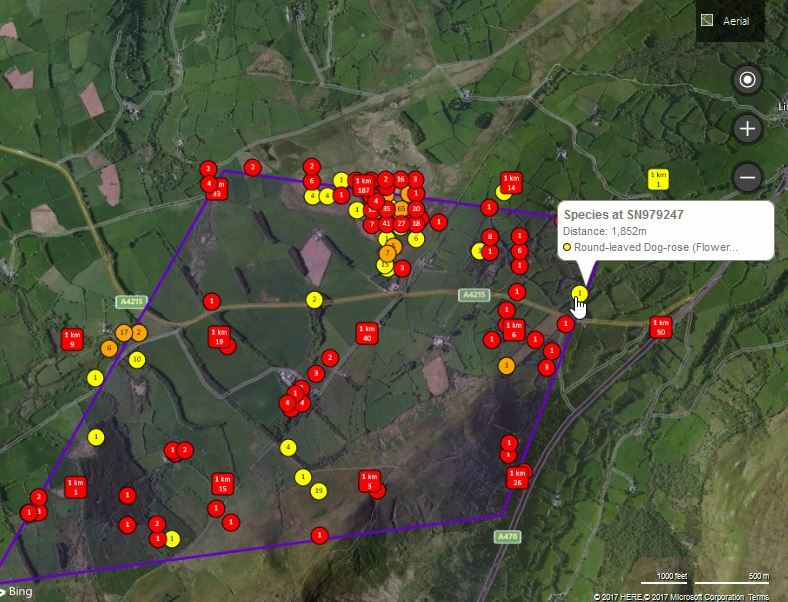 Montgomeryshire Wildlife Trust species records collated and digitised by BIS. Many are for MWT Reserves or Wildlife Sites. All records collated from species records mobilised from former Countryside Council for Wales regional files, held at Newtown, Abergavenny and Llandrindod Wells offices. Radnorshire Wildlife Trust species records collated and digitised by BIS. Many are for RWT Reserves or Wildlife Sites.